We’d love your help. Let us know what’s wrong with this preview of Michael Caine - Acting in Film by Michael Caine. To ask other readers questions about Michael Caine - Acting in Film, please sign up. I bought this book a few years ago when I was cast in my first film role, to prepare me for working on set, to understand how movie making works and what my role would be, what working with other actors and film crew would be like. I burst with excitement when I got the role and was sweaty and nervous; convinced I was going to blow it - and this book helped me through it. I made it out on the other side in one piece and had a lot of fun getting there. It's a very handy practical guide to day-to-d I bought this book a few years ago when I was cast in my first film role, to prepare me for working on set, to understand how movie making works and what my role would be, what working with other actors and film crew would be like. I burst with excitement when I got the role and was sweaty and nervous; convinced I was going to blow it - and this book helped me through it. I made it out on the other side in one piece and had a lot of fun getting there. Notes for me: This was a re-read for me. My Chaucer bookstore bookmark was about 3/4 of the way through. It makes sense that this was transcribed and compiled from a two day acting class that Caine gave. It is short and a very fast read. It is a quick dirty intro to acting on film, right down to marks and continuity. I had already learned most of his lessons in terms of film sets but it was a nice refresher and reminder especially about not getting in people's way. I tend to be so goofy happy to Notes for me: This was a re-read for me. My Chaucer bookstore bookmark was about 3/4 of the way through. Despite the fact the book is overpriced, too short, too vague, and littered with more photographs than copy, there is some value in Michael Caine's "Acting In Film: An Actor's Take On Movie Making." I did very much enjoy what Caine had to say, even when I did not understand what he was talking about. Film acting is indeed different from theater acting, as Michael Caine is quick to point out. There is a lot of technique involved in order to effectively portray a role on camera. 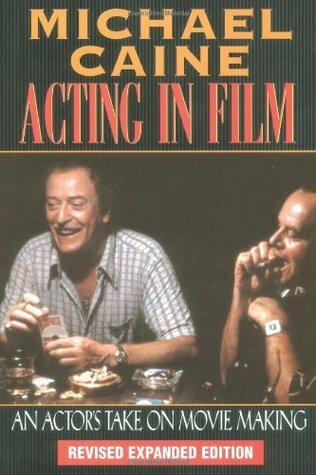 On stage, a thespia Despite the fact the book is overpriced, too short, too vague, and littered with more photographs than copy, there is some value in Michael Caine's "Acting In Film: An Actor's Take On Movie Making." I did very much enjoy what Caine had to say, even when I did not understand what he was talking about. Film acting is indeed different from theater acting, as Michael Caine is quick to point out. There is a lot of technique involved in order to effectively portray a role on camera. On stage, a thespian can be broad, and loud, and open. On camera, the actor must condense one's body and voice down to specific gestures and movements...as the lens intensifies everything. Blinking on camera is not recommended for those who wish to portray strength. A keen awareness of picture continuity is essential in insuring an actor's valuable time on screen, in addition to increasing a thespian's chances of being hired again. All this plus an awareness of breath, relaxation, and human psychology will help turn a stumbling film and television actor in a great one. The author also goes into the importance of professionalism and behavior on and off set with members of the cast and crew, as well as the Do's and Don'ts of how to deal with troublesome actors and directors, as well as dangerous stunts. Great advice on acting and life... I read this in one sitting. It's mostly pictures and the type is large. In all it's a quick read with some interesting ideas especially for people who want to be actors. It's hard to imagine a stage in an actor's career when this wouldn't be useful. Michael Caine is brilliant. How often does an actor of his caliber talk about how it's done? Yeah, I liked it. If you're interested in being an actor for film, this is essential reading. هنرپیشه ی خوب لزوما حرفی برای گفتن نداره. I was hoping for more insight on techniques in front of the camera - similar to Michael Caine's great acting masterclass from 1987 (I believe), which can be found on YouTube. Instead, I found most of the book explaining how to professionally conduct yourself on a film set and less talking about acting specifically. I think if you can find this book for cheap, it's worth a read. Definitely, check out his masterclass on YouTube. Most of the acting topics that are covered in the book are explained I was hoping for more insight on techniques in front of the camera - similar to Michael Caine's great acting masterclass from 1987 (I believe), which can be found on YouTube. Instead, I found most of the book explaining how to professionally conduct yourself on a film set and less talking about acting specifically. I found this book gets the reader to understand more than the acting itself but a better understanding of everything going on around the set with the crew to better prepare oneself with each scene. Very straightforward advice from an accomplished actor. This was a great read- even if you are not into learning about the acting process. I found it insightful and funny and really useful and delivered in the way only Michael Caine can. I will definitely try and incorporate some of his tips in to my acting classes. It isn’t so much about any one technique, but there’s so many good tips and stories in here. Quick read, but I wish it was longer! ! A short book with practical tips about working in the film industry. Worth the read if you want to work in the film industry in some way. This review has been hidden because it contains spoilers. To view it, click here. 생각보다 굉장히 practical한 가이드였다. 그리고 이 남자 생각보다 굉장히 꼼꼼하고 계획적이고 어쩌면 좀 재미없는 사람이라고 느꼈다. This was a shorter book than I expected. Nevertheless, it has a great deal of valuable advice, especially for actors working in the movies. I don't anticipate doing this myself in the near future, but I do a bit of acting on stage (as an amateur) and some of what Caine says here is applicable to that. I like his basic down to earth approach, no frills, just good solid hard work. It's his professionalism that shines through in this book. Don't think of being an actor (a professional one, anyway) This was a shorter book than I expected. Nevertheless, it has a great deal of valuable advice, especially for actors working in the movies. I don't anticipate doing this myself in the near future, but I do a bit of acting on stage (as an amateur) and some of what Caine says here is applicable to that. I like his basic down to earth approach, no frills, just good solid hard work. It's his professionalism that shines through in this book. Don't think of being an actor (a professional one, anyway) if you're not prepared to give your all to the time you're being paid to work. He's helpful with learning lines, and with working on a character; while he's not a method actor, his 'method' is sound and useful. He's very helpful in making the distinction between stage work and screen work. There are still very good stage actors who get caught out when they first work in a movie. Loved it!! I read a lot of acting books but not to many are as good as this one. Most acting books have annoying step by step instructions but they don't give any examples!!! In this book he backs every piece of advice with a story. It's both good for acting and it's nice and entertaining! It has stories when he worked with Sylvester Stallone, when he auditioned for his first motion picture, etc. He tells us everything!!! Michael Caine's new book The Elephant to Hollywood reminded me that I had read this one. It teaches lots of specific things that you only learn with experience, but this book is old enough that everything in it is probably online somewhere. I enjoyed the way he weaved his lesson or teaching with an experience of his own. A very entertaining, short, helpful, addictive read. I bought this on a whim, and I'm pretty sure it's one of the few (if not the only) successful blind book purchase(s) I've made (Da Vinci Code, anyone? blegh). I read it straight through from start to finish, and will probably reference back to it in the future. A transcript of a lecture Michael Caine gave, it's an excellent collection of almost-disjointed thoughts on one of the most successful actors of the last few decades. His unique path gives him unique insight - not only into acting - but into interacting with people up and down the economic food chain. Lots of good advice and info here. I think Michael Caine is as neurotic as he is passionate about the craft. Maybe even more than I am. There's a nice balance here between practical advice for actors interested in making movies, and good acting tips in general. I'd recommend this to anyone interested in acting. When you are reading a book on acting by air Michael Caine you know it's going to be amazing. But this book was beyond amazing. It gives you amazing insights upon acting and simple guidelines that can be learnt and understood by everyone. This book is for every budding actor and I recommend it to all who love the acting business. I re-read this book after about 10 years after having a conversation with a colleague about how it's a pretty good guide for people who are media spokespeople. It's a quick read -- I read it start to finish while in-flight on a business trip. It was just as good as I remembered. Of course, not all of it is applicable to work, but I love the insights about the complexity of the movie business. What a treasure. Anyone who is a fan of film and especially a movie buff has to read this. It opens your eyes to what goes on in acting, and it has a wonderfully copious amount of anecdotes about the greatest directors, actors, and producers that is highly valuable to any students of the medium. It only took me about a half hour to read, and its impact will reverberate with me for much longer. This book gave a lot of knowledge and new perspective on acting and film making. Micael Caine is truly an exceptional actor, and he successfully wrote this book in a way that people of all interests can enjoy. I like how this book is by someone who you feel like you know because you've seen so much of his work. You know what he says is spot on because he's worked forever. It's pretty much general self-help, not the most thrilling or inspiring acting book. But there is some very practical good advice. After reading this you will realize that Michael Caine is kind of a pompous....you know (that is, if you didn't already know that before hand). However, dude does know his stuff, so I say it is useful for all those aspiring actors out there. resourceful and something every actor should read. it's common sense but it's a guiding star not something shovelling down your throat. as a director i believe understanding the actor is important so this book is brilliantly simple in that context. Sir Michael Caine, CBE was born Maurice Joseph Micklewaite near Elephant and Castle in South London. His first major starring roles, beginning in the 1960s, include 'Zulu,' 'The Ipcress File,' and 'Alfie.' He is a major Hollywood film star and two-time Academy Award winner with a career spanning over sixty years.